Self growth your way: Is drinking ice cold water bad for your health? There is no scientific or medical study regarding the harmful or good effects of drinking ice cold water, but in alternative therapies like Chinese or Ayurvedic systems, there are some theories which say that drinking ice cold water on regular basis may harm you. The average normal body temperature is 98.6°F (37°C). The ice drinks will bring down the temperature and slow down the energy and blood circulation inside the body. The coldness can be stuck somewhere in the body due to constant ice water intake, this will cause energy blockage. If the blockage occurs in the lower abdomen (which often happens to females), where uterus and ovaries are, many female related diseases and problems could appear including infertility and aging faster. If the energy circulation slows, the metabolism slows, over weight is the result of that. Aging and diseases are all the results of either slowing or blockage of energy inside of our body. Low temperature is one of the causes. A cup of ice water may make you feel heavenly after a sweaty exercise or at the time you feel really hot. But that cup of water could hurt you 10 times more due to the sudden cooling inside your body especially if you quickly finish it. According to Ayurveda, ice cold water or drinks hinder the process of digestion and slow down the Jatharagni (digestive fire). As a result, food is not digested properly, leading to the formation of sticky toxic material (ama) in the small intestine. Other effects include under nourishment and blockage of body's channels (srotas), which can further lead to hundreds of diseases. 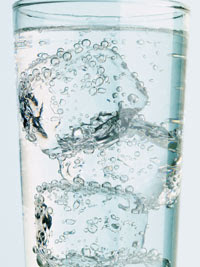 Ice cold water is very bad for patients because their digestive fire is already weak due to low levels of immunity. There is an urban legend that if you drink cold water, especially after eating, you’ll get cancer. The theory, which has been widely circulated via email, suggests that cold water solidifies fats you have just consumed, quickly causing toxins to create cancer in your body. Sites devoted to proving or disproving urban legends, like snopes.com, have defeated this theory quite effectively. * A discussion at a health forum: Is ice water bad for u? I like how you discussed the effect of drinking cold liquids. Thanks for sharing this, I will lessen drinking cold drinks to be able to avoid energy blockage. No. Cold water absorbs more quickly into the body than warmer water, making chilled water preferable for hydration. It is a valuable information for the society, but it is up to the individual in which angle they take,the realisation power and adoption to the concept is a major factor.As an Electrohomoeopath/believe in natural medicine,and the medicines/ extracts from plant and vegitables are made at the body temperature,hence it is quicker and safer observed in the body, faster then any other!! !The essance of the pathy.These things to be researched by the medical science then only people of western culture will believe!! !It is never late then never.Adopt the concept using intelactual/inteligency what not what else for your better life style.Thanks ,DR Teena.